There was no stitching on this Tuesday night. I stitched a little tiny bit on the surprise for my daughter. Not much stitching Wednesday night either. Tried the birds and did the gate. Tried this and not sure if I like it. I will check it out in the light of day tomorrow. The green hill in front of the church was Sunday evening's project. I love this stitch with the overdyed thread. 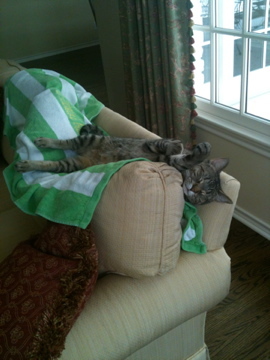 I was given all day Monday, Memorial Day, off. I suspect my husband wanted to cook dinner so he could have plenty of butter and salt on his steak. I am not one to look a gift horse in the mouth. I took my seat on my seat and stayed there. I got the back hill almost done. 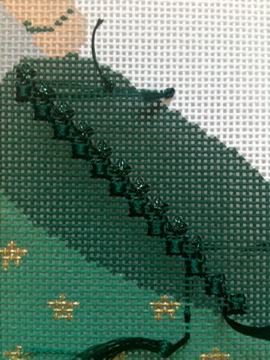 I also tried the stitch on one of the dark green trees, but it does not show well. I also continentaled most of the fence in the lower left. Pretty good for a "day's work". Hope everyone had a wonderful Memorial Day. This is what I got done Friday afternoon and Saturday afternoon and evening. 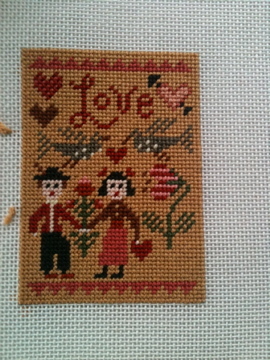 I love Amy's stitch choice and thread choices. 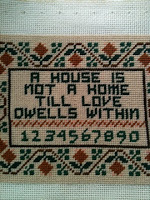 I am going to a party today and when I get back I will settle in to stitch through Tuesday morning. Happy Memorial Day! Pocketful of Stitches posted all their available Petei stock on their blog, pocketfulofstitches.blogspot.com. This guy is still available. 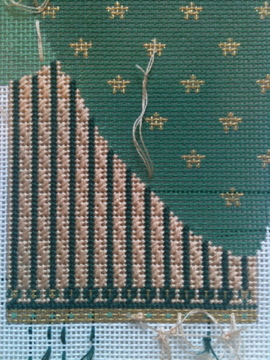 The stitch guide is by Diana Bosworth at The French Knot in Fort Worth, Texas. It finally came in the mail! My beautiful birthday canvas! Did I wait to go get the proper sized stretcher bars? NO. I rigged it on what I had and did the pond. This is Ewe and Eye's Sunday Meeting canvas which I have had my eye on since March of 2011. I never forget a canvas. That must be the Scot in me. I will go to The Needle Works today or tomorrow and get some Evertites in the appropriate size. The pond is what I got done on Thursday night. 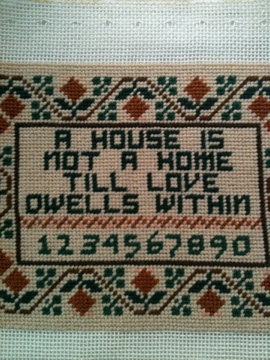 I love this stitch. I have used it before for the body of Santa's sleigh. Very cute. 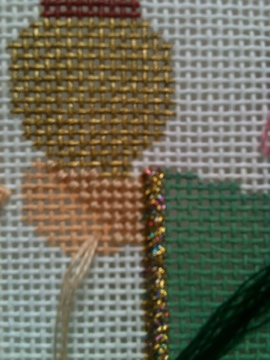 Wednesday night I added size 12 Kreinik #329 to the cape stitch. I like it so much more now that you can see it! Tuesday night saw very little progress. I stitched his face with four strands of floss and did his cheek. 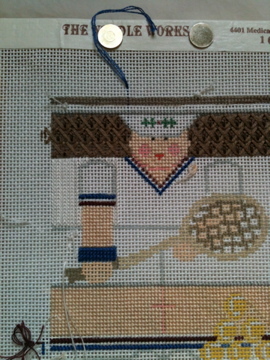 I began the basketweave on the hand and just pooped out. Fortunately, I got to go The Needle Works today, Wednesday, and work on the overcape which is almost finished. Hopefully, I will be a little more energetic this evening than last. Maybe I will skip the drinks with dinner?! 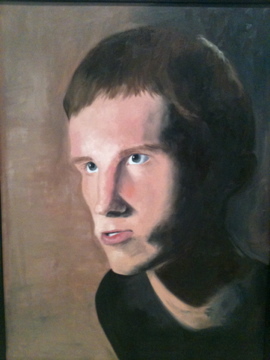 Below is my daughter's painting that was on display at Bass here in Austin. She is so good with faces if I do say so myself. Here is Monday night's efforts. I like the diagonal cashmere in the channels. It gives the impression of folds if you look at it from a distance. Sunday morning was spent at Taco Shack and getting people ready to go to camp. Then the people had to be driven to camp. Not much stitching was done. I finished the lines on the underskirt using three strands of Splendor. 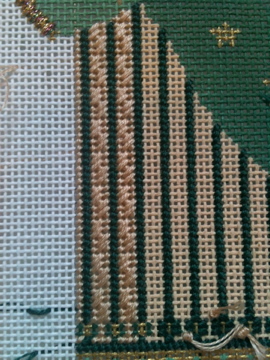 The cashmere stitch in the channels is being done with three strands of floss. More soon. This man looks a lot better in person. I ran out of the Neon Rays and pray the cards at The Needle Works are the same color. 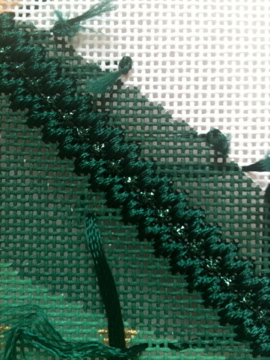 I found some Splendor in my stash and I am using three strands to tent stitch the green lines in the underskirt. What to do next? I took out the icky stitch and tried Byzantine with Smyrnas. Like it a whole lot better. The smyrnas are Kreinik size 8 and the long stitches are Neon Rays. I think a trip to The Needle Works might be necessary today to buy some more of each. 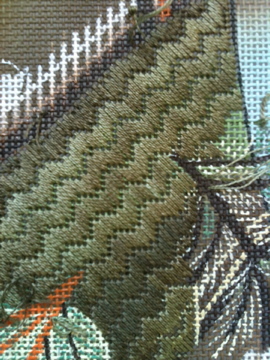 I do not like this stitch, but like my thread selections. Byzantine with smyrnas will be the next try. 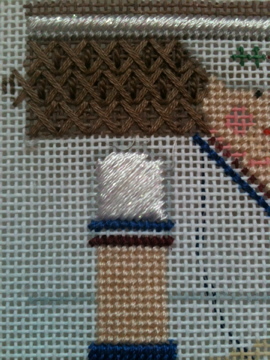 Lots of stitching last evening with very little satisfaction. I guess it was one of those nights. Better luck tomorrow. 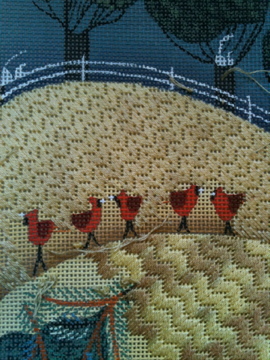 One of my fellow Swans is working on the companion piece to my Melissa Shirley's Cream Farmhouse. 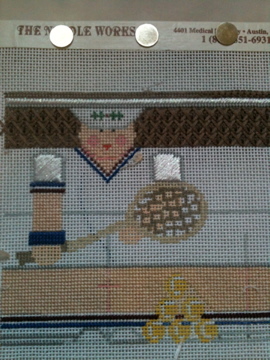 I am trying to make this tennis boy's sweater look like a cable knit vest. I don' t know if I am achieving that or not. My children gave me a gift certificate to The Needle Works for Mother's Day. I couldn't drive over there fast enough today to buy this fellow. I will post progress as I make it! 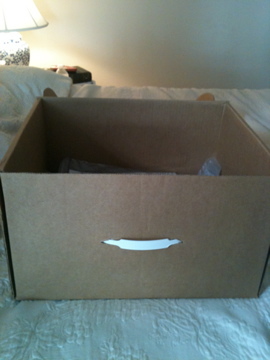 This box is kept in a cabinet in our TV/Steph's Stitching room. It contains a big secret. All these canvases have been finished, but not finished if you know what I mean. Why? Indecision, haven't finished the rest of the series, and forgot they were there. I will get to work. Hopefully, there will be finishing on the blog soon.